I’m currently trying to consistently consume certain things. Food at specific restaurants, shows, books, alcohol, online classes. If I don’t try, then I just sit watch Instagram stories or online shop. I call this my intentional vs default state of being. Here’s the thing, I can work really hard during the week. I try to squeeze everything in. Then I see my weekends as this scarce, must-be-defended two days where I fall into my default state of being. I don’t want to put on makeup, I don’t want to go anywhere, I scroll on my phone too much. 1. 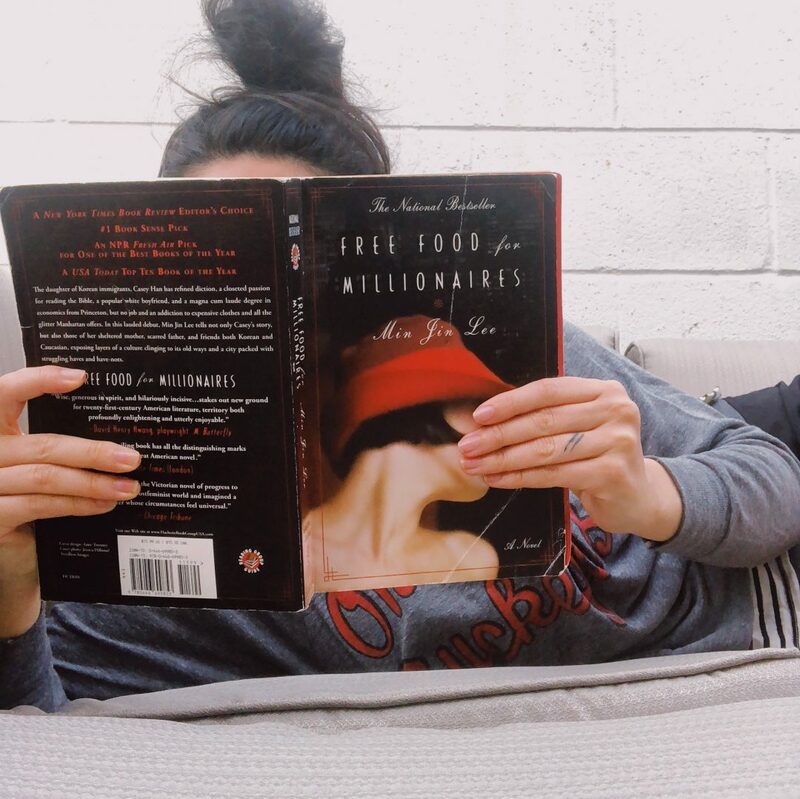 I’m currently reading Free Food for Millionaires by Min Jin Lee. So far, I love it. When I’m falling into my default state, I can tend to have my phone in hand vs picking up a book. I’ve been pretty good at reading lately but I don’t think my phone time has gotten reduced. 2. I just finished (as I am writing this post) Ugly Delicious on Netflix. In another life, I would have wanted to be a chef and I think I’m pretty good at cooking food. When I’m not being intentional, I can watch the same 5 shows that I always watch. 3.vOver the past 3 months, we’ve made it a tradition to go to Veritas for our close friends’ birthdays and we not only love their food but their Dolio (bourbon/fig) cocktail is something that I crave all the time. Does anyone else have a hard time branching out once you have your few favorite restaurants? 4. Templeton Rye is my favorite alcohol to drink on the rocks. When I’m out at a restaurant, I find that getting something like that as my drink order is waaay better for me than a sugary (or poorly crafted) cocktail. 5. I’m about to start a Skillshare class: Introduction to ProCreate. I use this currently and prefer it over Adobe Illustrator for my iPad Pro but I’m not taking advantage of every feature. What are you intentionally consuming? I am a creature of habit when it comes to restaurants. Brunch at the same place every Sunday–we’ve even started talking to the other regulars and know how they customize their meals. I can’t agree with you more about cocktails. Whiskey! Yay! I’ve become a voracious consumer/reader/listener of audiobooks. I have a 45-minute commute and used to arrive at work wound very tightly. No more! My favorite lately is How Women Rise by Sally Helgesen and Marshall Goldsmith. I usually don’t read self-help books, but this one obsessed me. I listened to it twice, back to back. It sounds like we’d get along pretty well as meal companions. I wish I could get into audiobooks. I blame the 2-minute commute that I have! I love the shift in thinking. My partner brought up to me a couple of weeks ago that he felt like he wasn’t choosing what to do with intention during the day. So now, with his permission, I can give him the gentle reminder of “Are you being intentional with your time?” Then, he gets to think about it. Sometimes, yes, he does want to watch Netflix. Otherwise, it sparks him to do something new. I have started to shift it to myself and it is making such a difference! Even being intentional about dishes done before bed because of how much better it starts my morning to walk into the kitchen! That is really amazing that he asked you to help with those intentional (or lack thereof) moments. And I really resonated with the fact that sometimes you DO need Netflix! The other day I did the dishes before eating my dinner because I never want to do them after. I got that tip from my friend Simi and love it so much.